Death count in CT school shooting up to 27 now, including kids. No politics right now. Let's just mourn. I didn't watch the news yesterday. I watched the after-shocks of yesterday's horrific shooting in Newton, Connecticut in the reflections and reverberations from my circle of friends and of other people I follow online. There was an outpouring of grief - people were sick with grief - and then there came the anger and the fury - and it still comes in waves - the grief, the sickness, and the anger. And between the grief, the sick, and the anger there too was politics. For myself, the only one - of whom I follow online - who asked for "no politics right now" was the local journalist, above - but I know it was a more common refrain for others. Politics doesn't have a place in the media's blueprint for covering mass shootings. I have to agree with Roger Ebert: if we want look past the complicated issues of gun control and mental illness and instead turn a tragedy into an absurd Rorschach ink-blot test then I'm going to choose mainstream news programming for my scapegoat. But I'm not really interested in scapegoats. I'm interested in making sure that this tragedy never happens again. That's why I think the time to politicize the matter of lack of gun control is right now. One guy tries to use a shoe bomb = Everyone at the airport takes their shoes off. 31 school shootings since Columbine = no changes. To conservatives: Both voting and gun ownership are our rights. Can you demand the same high bar for gun buying that you want for voting? Norms change. Many Americans are now challenging the belief that gun ownership in the United States will be forever immune from the aftershocks of shooting rampages. But whether that this belief can be turned into better legislation will take more than a petition - it will take organization, effort and time. In 1971, over 400 children died in cycling accidents in the Netherlands. This was a time - as explained in this short video and blog post - before the bike-friendly infrastructure was in place in Holland. 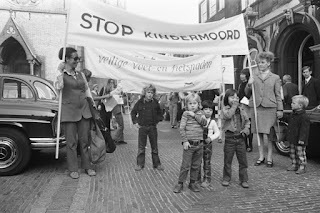 And this continuing 'child-murder' drove the Dutch to the streets to protest the horrible situation and to 'Stop de kindermoord'. 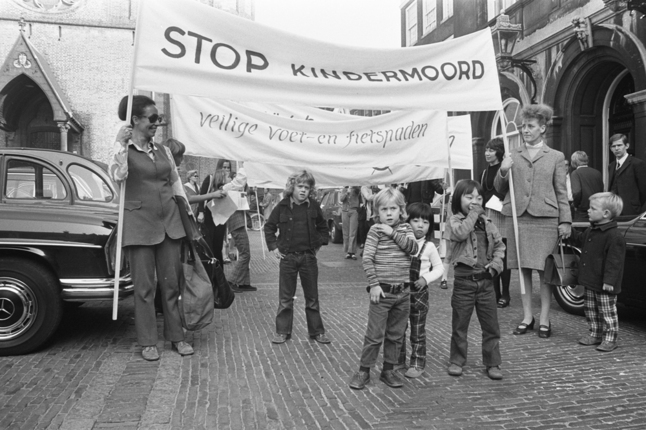 And it was these protests that helped the Dutch get organized and politicized and positioned to develop their coveted safe for children cycling infrastructure. A child's death is an tragedy. A preventable child's death is an outrage. Preventing others from trying to save children's lives in order to preserve an intangible historical construct is the worst kind of politics. The time to tighten gun control and to extend mental health support to everyone is now. I agree. The only reason we don't get as many tragedies like this in Canada is that gun culture is not nearly as embedded here. But the lack of support for mental illness is just as shameful - and dangerous -- in Canada. While lobbying for proper mental health funding will be an ongoing battle,I think we can all take small but important steps by working to de-stigmatize mental illness. Next time you or someone you know is suffering from depression, anxiety, bipolar disorder, etc., talk about it We're all still too scared to admit to any mental weakness for fear of losing friends, respect and even employment. The fear of being shunned or thought of as "lesser than" is very real. Wouldn't it be great to see a massive grassroots protest -- like the one Mita describes in the Netherlands -- to promote awareness and caring for mental health issues?